I celebrated my birthday yesterday and the first thing I did was thank God for such a wonderful life. I remembered my mum a lot and of course missed having my family here. My daughter however made the day very special for me. We baked a cake together, she created a lovely ecard and gifted me a miniature painting done by her.Wishes and blessings from friends and family brought a huge smile on my face. It is so great to feel wanted and loved by so many. My dear hubby gifted me with an airline ticket to Dubai. I am excited as I get to spend another week with my daughter and also get to spend time with my older son and his girlfriend. I have been a transit passenger thrice at the Dubai airport and now finally I will actually get out to explore the maya nagri as its called…. fantasy city. A lot has happened since the time I decided last year to make my 50th special. Happy and sad events occurred during the year but life has to carry on. I am glad I decided to share my cooking experiences with my followers and I have got a lot of support from you. Thank you so much. 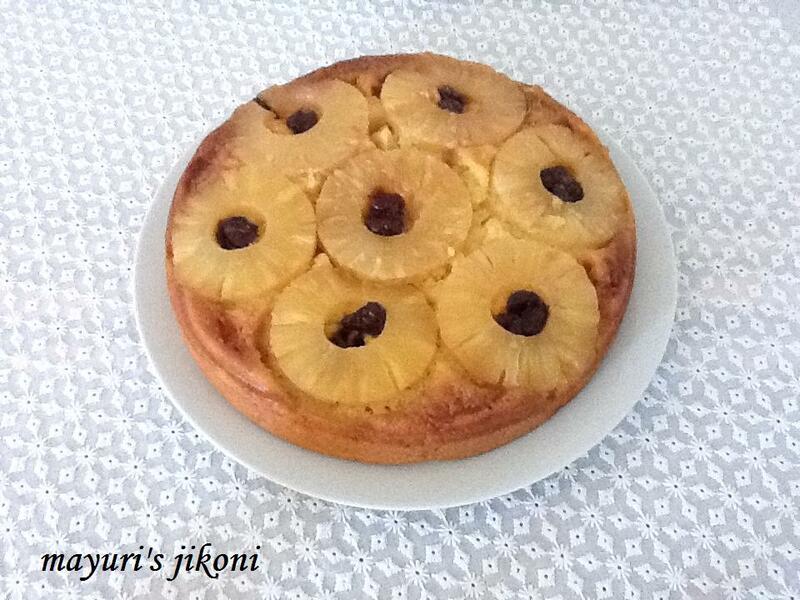 My daughter and I baked an upside down pineapple cake and were happy with the end result. I was surprised that the cake turned out really spongy in spite of it being eggless. I got the recipe from 4th sense cooking and I must thank Nithya for sharing such a lovely recipe with us. I just made very tiny changes, didn’t use pineapple essence as I didn’t have any and added a wee bit more water. Also for convenience, I have noted down some of the measurements into a cup measurement rather than grams or ml. Butter a 8 or 9 inch cake tin lightly. Prepare the caramel first by putting the sugar, water and butter in a heavy bottomed saucepan. Heat the mixture over medium heat and stir it all the time. The syrup will begin to turn light brown after nearly 5 minutes. As soon as it turns golden brown, take the pan off the heat. Immediately spread the caramel over the prepared cake tin. Arrange the pineapple slices and cherries as you wish. Sieve the flour with the baking powder and baking soda. Cream butter and condensed milk till it is creamy and soft. Add the essence and food colour and mix thoroughly. At this stage I mixed the water and milk. Add the flour mixture and the water mixture. Whisk or whip till the flour is completely incorporated into the liquid. Do not over mix. Pour the batter over the pineapple slices in the tin. Bake the cake for 30 to 40 minutes. A fork or toothpick inserted in the middle of the cake should come out clean. Once the cake is baked, remove it from the oven and immediately transfer it to a wire rack to cool. Serve the cake on its own or with some fresh whipped cream or hot custard. Tastes delicious. To transfer the cake onto the wire rack, place the rack upside down over the tin. using your oven gloves, Hold the rack and tin with both your hands and flip it over. Place the rack on the work top gently and remove the cake.The pineapple slices should appear on top. You can avoid using the food colour, but the cake will be pale in appearance. The caramel will appear like toffee when it has been spooned into the tin but on baking it softens again giving the pineapple a lovely caramelised taste. Add pineapple juice instead of water.